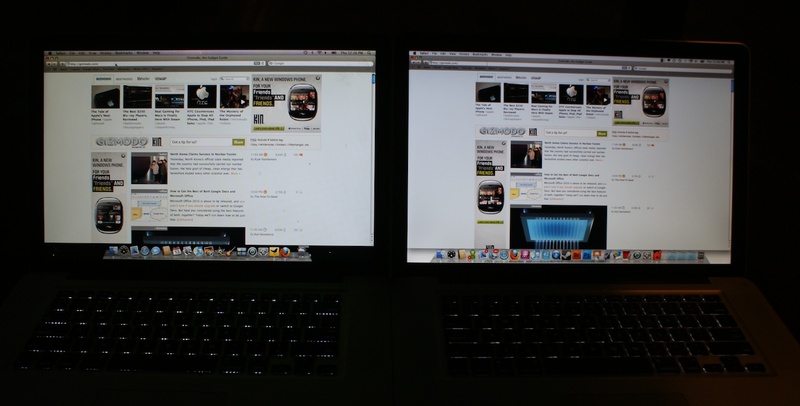 MacBook Pro 15: Is The Higher Resolution Screen Worth It? With the newest version of the 15-inch MacBook comes a new option: a 1680 x 1050 screen - about 30 per cent more pixel-y than the original 1440 x 900 unit. But how does it look? Do you need the extra dots? • That slightly subdued brightness pays off in deeper blacks. The newer screen's blacks were obviously inkier, though darker greys tended to be represented as black, while the older screen resolved dark gradients a bit more finely. • colours were more vivid on the new screen, though as with the pitch-dark blacks, bright colours could almost seem too saturated. This was only noticeable in side-by-side comparisons, though - it didn't stand out on its own, and the effect was generally preferable to the light-bled colours of the prior model. • Whites are equally pure on each. The prior model's brightness increased brightness wasn't evident here, strangely enough. • Vertical and horizontal viewing angles seem to be about the same, which is to say satisfactory and fantastic, respectively. Minor point: Viewed from the side, the older model tinted green, and the newer red. Green is the less distracting of the two, I found. My overall impression, despite the slight decrease in brightness (which isn't in and of itself a good or bad thing), is that the newer screen just looks better - sharper, richer and without the slightly washed-out colours of its predecessor. The increased pixel density is actually subtler than I had expected. The OS X interface displays smaller, obviously, and web pages tend to render with plenty of white space, not having been designed for a 1680 pixel screen width. There's just enough horizontal room here to tile a browser and, say, an email app horizontally, and the extra pixels come in handy when using panel-heavy apps like Photoshop, but really, I can't tell you guys anything about the basics of screen resolution that you don't already know. More pixels=more stuff! Magic! What I can do say is that the added resolution isn't too much, and that it's appropriate for the display's side - that jump from 1440 x 900 to 1680 x 1050 is pure benefit, and if your MacBook is your primary machine, and its display your primary display, it's probably worth the $US100 (or $US150 for anti-glare) premium.